When I was growing up, I remember countless fads and trends that came and went, either in the confines of school or within my group of friends at home. We could be trying to learn the latest cool trick with our ‘YoYos’, arming ourselves with plastic lemons full of water (our teachers hated that one! ), skateboarding, scrambling on bicycles not built for the rough stuff and many more harmless activities that occupied us for a couple of months until the next big ‘thing’ came along. It’s fair to say, and I think you’ll agree, that there was nothing particularly dangerous or sinister about our childhood fads (apart from those, maybe, that experimented with smoking or alcohol); however, in these days of social media, the historically innocent world of fads and crazes appears to have found a much darker and frankly disturbing format that worryingly some children appear to be compelled to follow. In recent years, one of the most high-profile online crazes was the furore surrounding the Internet meme ‘Slenderman’ - a fictional supernatural character that was created on a horror Internet forum as part of a competition whereby users were asked to edit existing, everyday photographs to make them appear paranormal. The original poster submitted two black and white images of a group of children and added an abnormally tall and thin, phantom-like figure, in a black suit with no distinguishable facial features - this became known as the ‘Slenderman’. The whole phenomenon went viral on various social media, with a whole wealth of new photographs and stories appearing daily and it wasn’t long before claims were being made that the character was, in fact, real. In May 2014, however, two girls in Wisconsin took the phenomenon to a whole different, macabre level. When they allegedly took a twelve-year-old classmate to woods near their home and stabbed her 19 times, saying to the authorities later that they had attempted to commit a murder in order to become ‘proxies’ of the ‘Slenderman’ - their victim survived. Another craze started out as a drinking game in Australia. The original idea of the game, which was given the title of ‘Neknominate’ or ‘Neck and Nominate’ was to ‘neck’ an alcoholic drink (usually a pint of beer) and then nominate others to do the same. When comments, images and videos of ‘Neknominate’ participants started to appear on social media platforms it again went quickly viral. The problems with these crazes come when the competitive spirit of some the potential participants takes hold and they consequently raise the level of the challenges. In the case of ‘Neknominate’, it was alleged that five people died as a consequence of the challenges - one participant fatally downed a pint of vodka, whilst another died after reportedly mixing an entire bottle of wine, a quarter bottle of whiskey and a can of lager and ‘necking’ the lot! Thankfully, some good did come out of this irresponsible craze when a group of South Africans decided to turn it on its head and challenged others to carry out random acts of kindness for others - these also spread virally and picked up such titles as ‘Feed the Deed’ in Canada and ‘SmartNominate’ in France, which encouraged people taking part to give food to the homeless or donate blood. Unfortunately, it would appear that the spread of crazy and downright dangerous pursuits over social media shows no signs of letting up. In May 2015, the Mail Online reported on a new, and in my opinion, staggeringly stupid, craze called the ‘Fire Challenge’, where young people filmed themselves pouring an inflammable liquid over their bodies and setting themselves alight. There were alleged cases where stunts went wrong and the participants were left badly burned with a 15-year-old in the USA reportedly burned to death when his entire body was engulfed in flames. In more recent years we have faced other challenges from 'Am I pretty? ', not a physically dangerous game but one which could destroy a teenage girls self-esteem, the 'Cinnamon Challenge' where participants tried to consume a spoonful of cinnamon powder', to the 'Blue Whale Challenge', which it has been suggested was a hoax, but nevertheless stories were found of young people taking their own lives as a result, to name just a few. An now we face, quite literally, Momo. This challenge has taken over the media in recent days, with warnings from schools, police, charities and more about the dangers it creates. In brief, this is also known as the ‘suicide game’ played on WhatsApp. It begins with a disturbing face appearing (this image is actually taken from a sculpture by a Japanese artist). This character encourages young people to add contacts on the messaging service and then replies with threats of violence, and encourages self-harm and suicide. 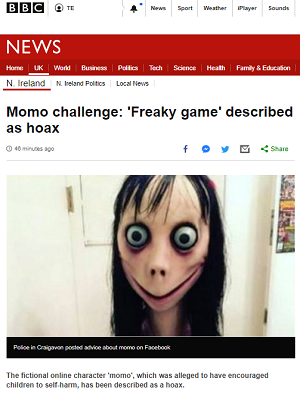 It is suggested that those responsible for ‘Momo’ are hackers looking for information. However, as with the Blue Whale Challenge, it seems that this too is a hoax, but it can still be causing distress to young people. These days, social media provides a vehicle for fads and trends to spread virally throughout the global community like nothing else previously - even television cannot claim to have contributed to the proliferation of historical trends anywhere close to what the Internet can. The ubiquitous nature of Facebook, Twitter, YouTube and other social platforms that can be accessed via desktop and mobile devices means that any potential phenomena can reach a huge audience very quickly. But not all Internet crazes are bad. A positive example of how a craze can go viral occurred in the US, by way of the ALS Ice Bucket Challenge, where a person dumps or has dumped on by friends, a bucket of ice water over their heads to promote awareness of the disease Amyotrophic Lateral Sclerosis and encourage donations to charities involved in research of the disease. In the UK, people took part in order to support the Motor Neurone Disease Association. Have you had experience of social media trends in your school? What is your school doing to tackle the issue? What positive outcomes have you seen from talking to pupils about this? Let us know your thoughts and suggestions using the comments section below.